Isn't he handsome? Isn't he clever? 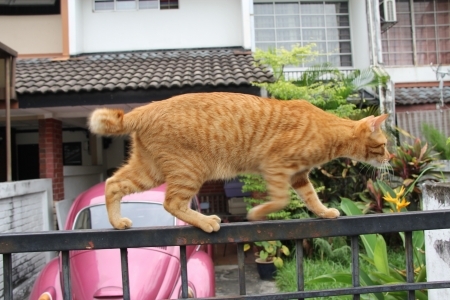 Our little Guido walks up and down on the 1 inch gate top every day with the skill of the professional acrobat. Woah, now that takes skill! i admire d tail..gave him a purrfek balance..
Wow! Hmmm....even I won't attempt that. purrr.....meow! The only one of us who could do that, I think, is Binga. Which is weird because one would think it would be me! circus ringleader, " PRESENTING!!!! GUIDO, THHHHHHHHHHHHHEEEEE MAGNIFICENT!!!". Holy Moly, that is impressive! Okay... that's impressive.... It's such a narrow thing. Great job, Guido. Wow, you are good, Guido - Barnum and Bailey Circus will be looking for you. Wow Guido, I am super impressed!!! You are quite an acrobat. We can do that too - but Mum can't look when we do! Great balance Guido. I like to do that too. That sure is some fancy footwork Guido! Wow! You have wonderful skill! he does indeed look sure pawed! Agile kitty! That is a great shot! Guido...you make me feel a bit fainty with the depth of my admiration. This is Katie Bella..I'm using mommy's account. You are so sleek and handsome Guido! You are very talented, Guido! Great job, Guido! You do that so effortlessly! Good job Guido. You sure look like you are enjoying that walk. You could win a tight rope contest. Take care. He is a professional acrobat. He's a cat. Oh my goodness, how amazing! You've got a great balance...1 inch, wow! It scares me a little to see you like that but looks like it's very easy for you :-) You can totally walk on a tightrope! He looks just like a little tiger! Very confident and ManCatly! way to go Guido. i admire your courage and determination. Hey Guido, I also recommend walking on top of the curtain rail to see if your mummy cat also admires you for that! Go Guido! Pepper might be able to balance like that but the others wouldn't stand a chance! Wow! Guido, you have great skill and balance!! Paws up, friend! wow! you are brave and talented, guido!! Handsome, clever and all cat! Ohhhhh, amazing! What an artist you are ;:OD) Truly amasing! I have learned a new word by a mistake!! !